Gentle reader, do you have strong feelings about signs? Now's your chance to let the city know how you feel. The city is working on an update of the sign ordinance (Title 5, Chapter 61). To help with this process, the city has launched PictureThis, a web app that lets you upload, geotag, and comment on the signs you see, all anonymously. Right now there are only 44 pictures uploaded, but some of the comments are really great. Take for example this one below, where someone feels personally insulted by this Verizon Sign. 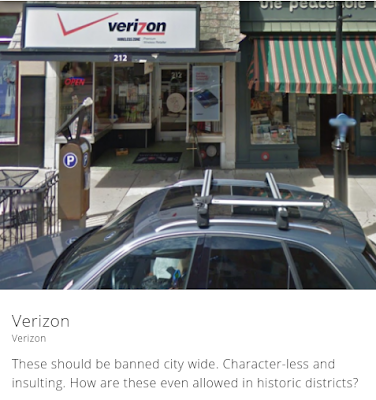 Gentle reader, why don't you check out PictureThis and give the city feedback on your favorite signs.